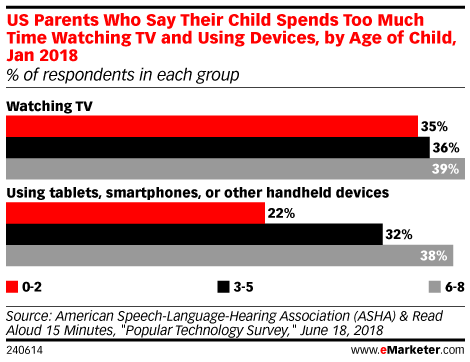 Data is from the June 2018 American Speech-Language Hearing Association (ASHA) & Read Aloud 15 Minutes "Popular Technology Survey" conducted by YouGov. 1,022 US parents of children ages 0-8 were surveyed online during January 19-26, 2018. Read Aloud 15 Minutes is a nonprofit organization of community partners aimed at encouraging parents to read aloud to children. American Speech-Language Hearing Association (ASHA) is a national association of speech-language pathologists and audiologists.